Style Shop -- The Style Shop, managed by Edward Corey, will open its doors for business in the Lyman Block on Friday morning. Style Shop — The Style Shop, managed by Edward Corey, will open its doors for business in the Lyman Block on Friday morning. Remodeled — The improvised grandstand, which has served its purposes for the band concerts this past summer, was removed from the square on Wednesday morning. Retirement — After 43 years and four months’ service as freight foreman at Caribou for the Bangor and Aroostook Railroad Company, Harvey B. Donnelly retired on Aug. 31 because of failing health. He began his service as freight foreman on May 3, 1900, having previously worked five years with the constructors, Trites and Carter, in building the railroad line. According to Donnelly, back then, there were no railroads to Washburn, New Sweden, Woodland, Perham or Stockholm, and since these were pre-automobile days, all freight had to be hauled by teams and shipped from Caribou station. U.S. mail to Van Buren had to be carried by a tandem team, a one-way trip taking two days. Wesco foods open — The Wesco Foods Co. in Car-Chicago has established a permanent buying office on Water Street in Caribou to handle their Aroostook County and State of Maine potato business. 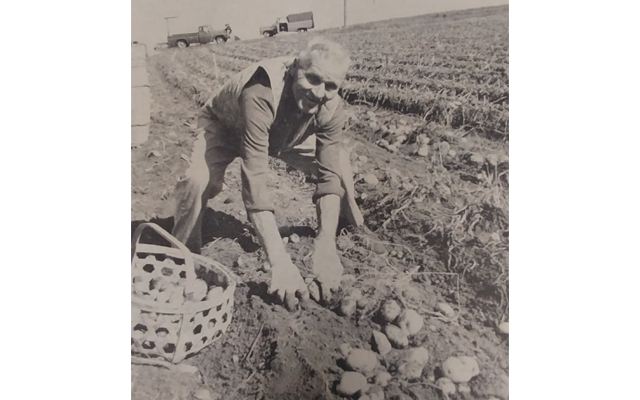 The office is in charge of Harol A. Tuxido, who also spent last year’s potato picking season in Caribou as a representative of the company. A&P opens — Company officials and community representatives were present for the ribbon-cutting of the new Atlantic & Pacific Tea Company’s new supermarket at the Caribou Shopping Center. The store boasts an attractive fresh produce counter, tastefully arranged with flowers and murals in the background. The entire store is eye-appealing in soft colors as well. Next governor? — Caribou native Susan M. Collins announced today that she will launch an exploratory campaign for the Republican nomination for governor in October. Collins, 40, is the daughter of Donald and Patricia Collins of 4 Dorcase Ave., Caribou, and is a 1971 graduate of Caribou High School. Collins served as New England Administrator during the final year of President Bush’s term. Under Collins’ leadership at SBA, the amount of guaranteed loans to small businesses in Maine nearly doubled. Nominations for governor are subject to review by the Joint Standing Committee on House and Economic Development and confirmation by the state senate. Looking for mama — A young black bear was discovered high in a tree in the backyard of Alonzo and Joan Keaton’s residence on Lyndon Street, Caribou, early Monday morning. Kenneth Keaton said the family first noticed the young bruin around 6 a.m. The bear found the courage to climb down the tree more than five hours later, and scampered to safety down an embankment along the Aroostook River.